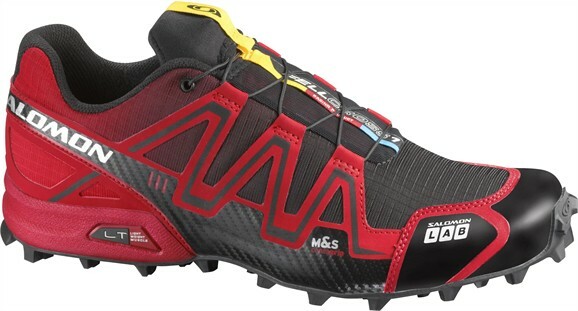 Introducing my newest racing shoe… Salomon S-LAB FellCross. Lightweight. Monster grip. This is a very different shoe from anything I’ve ever had on my feet. So far, I did a long trail run in these, as well as a trail half marathon. I’m glad I got to experience them on a variety of surfaces. Overall, they felt fairly light on my feet. I also noticed that they are quite a low (on the ankle) shoe (which meant I had to be a little bit more careful, as I almost rolled my ankle few times – but that’s the cost of light weight). Despite the fact that the drop is small on this shoe, my calves were ok by the end, but my ankles had to work harder I think. You were right about this shoe probably not being the right shoe for a beginner. Oh my god, the traction. I do not think I’ve quite experienced anything like this before. 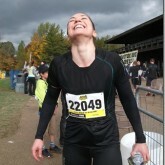 There were a couple of slippery logs covered with moss that I jumped on during the trail run, and I felt like Spiderman! Also, incredible traction on the steep downhills. I liked the fact that I could tighten them up easily before a downhill, and then loosen after. They were great on technical trail – with lots of rocks, as well as off trail – few times that we did get lost. I wore my regular racing socks (double-layered Wright socks), and the shoes felt pretty hot on my feet – it may be because I’m switching from a shoe that is largely mesh (Montrail Badrock), as these ones have quite a bit of protection around the toes. It rained the whole time. The weather sucked. The shoes rocked. Mostly. I especially loved (loved!) the grip on the uphills and the downhills. I specifically noticed the advantage on the downhills, because it was so slippery, a lot of people had to slow down, while I could actually fly down! Nice and grippy climbing on the steep inclines as well. The only exceptions (which I was aware of going into the race) were the smooth rocks – needed to watch out for them, as well as the wooden docks. While wet, the docks were deadly. I tiptoed ever so slowly over them, and still ended up wiping out pretty hard at least once. Still not sure, there is another shoe I’d rather wear. It was mostly human structures that got in the way – the wilder the trail, the better these seem. The trail was also VERY technical! Tonnes of chewed up rocks. I could jump from one to the other like a mountain goat. I liked the fact that the shoes felt really snug on the foot, but I did not actually end up with any hot spots. The sleek surface was nice in the wet conditions, as there wasn’t much for water to cling to. This is somewhat of a minimalistic shoe for trail running. It is not meant to support you in any way. Light and fast. The FellCross was designed for fell racing which is grass racing in the Fell region of England. Each shoe in the ‘SLAB’ series is a race shoe, not a training shoe and has a very specific design. This shoe is designed for very specific conditions, but not for every day. 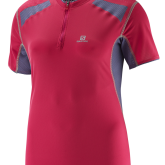 Our focus here is performance and protection, as this is very important to trail runners. In this case the protection is NOT on ankle support, but on a tighter woven mesh that won’t be as breathable as an open mesh but will keep small rocks and such out of the shoe. It also means the shoe will not go through a slight stretch during you race and force your ankles to do more work later on in the race. All mesh shoes will do this. Not road friendly. Keep it for courses where pavement is not a factor. 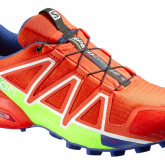 Salomon S-LAB FellCross is a fantastic racing shoe for off-road conditions – specifically, off-road obstacle racing, technical trail running and orienteering. The wilder the terrain, the better these shoes will perform. This shoe will best serve a strong runner, as it does not provide a lot of support. Road runners, stay away. These are not for running on pavement. Consider one of Salomon’s road-to-trail models instead.